Love the fit of those jeans! And that Trench is amazing. I just want to say that I only recently discovered your site and I LOVE it! You create fabulous, affordable outfits that are easy to replicate and look fantastic, and you're making it a lot easier than I expected to find my style and build my wardrobe! I also really appreciate the emphasis on work clothes, because I feel like work outfits are ignored but in reality they're worn just as often, if not more often, than "regular" clothes. Thank you and please keep on posting! Loving that green on green in necklace and blouse. That first outfit is absolutely adorable! I love the necklace and pumps! Love these. All of them. Nothing better than a pencil skirt~! I'd like you to come live in my closet and hand me outfits in the morning!! That turquoise blouse looks fantastic with the khaki. You just gave me some more inspiration to work with here! Thank you! Love them all! That red trench is amazing!! 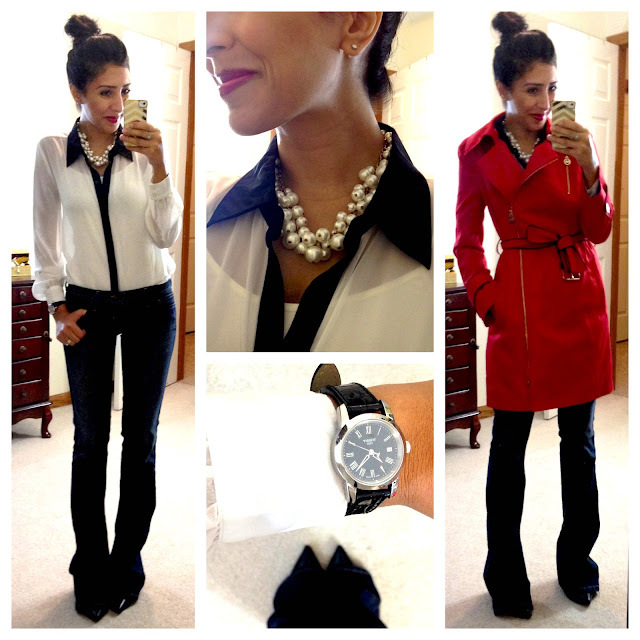 I love the black and white blouse and the chunky pearl necklace you paired with it! Love your style! I have been looking for the f21 chunky pearl necklace and can't find it. Do they not carry it anymore? I love all your outfits. You have such great style! Guess what I saw at Old Navy today!!!! I saw a long sleeave pink and white striped shirt that said Hello Gorgeous on the front I was going to upload a picture from oldnavy.com but I couldn't find it. 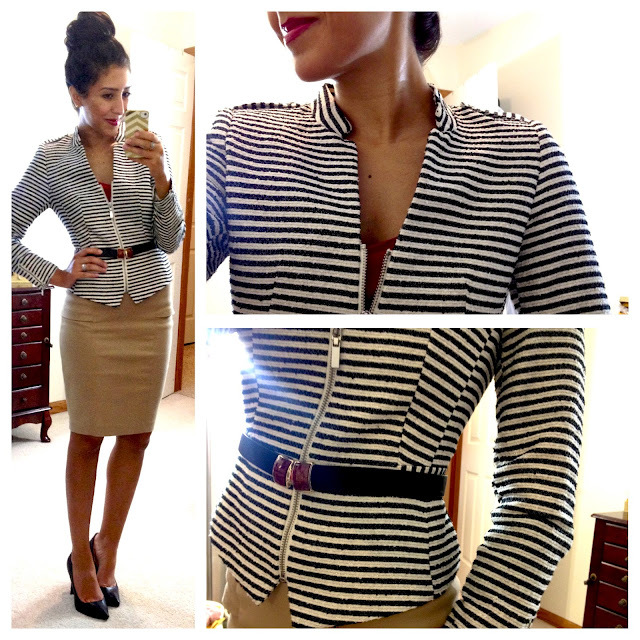 I love your bog I get cute work outfit ideas I have started to build my own work wardrobe and hope to keep learning more!! !